Wine—it’s good for the soul and for your heart (the medical community says so, anyway). Wine has been a staple on the dinner table for centuries, so it’s no wonder that wine has evolved into the $300 billion industry it is today. Anyone can go grab a bottle of wine off the grocery store shelf, but if you’re curious about how those grapes got confined to that bottle, or simply want to give your palette a new experience, go straight to the source. South Carolina’s many vineyards and wineries show you where the magic happens, all while providing relaxing views. Here are the 10 best in the state. You’ll find much more than a winery here. Escape to the middle of nowhere and enjoy the picturesque Chattooga Belle Farm. With their own onsite distillery, the folks at the farm manage every aspect of the wines they make, starting with the grapes grown in their own fields. After your tasting, be sure to check out their other offerings, like Belle’s Bistro, an 18-hole disc golf course, the U-Pick fruits, or the gift shop. No, they don’t let cats stomp on the grapes. But Joey the Cat holds a special place in the winery owner John Burk’s life, so he was a shoo-in for a mascot when the time came. They feature a small yet strong variety of reds and whites, sweet and dry, infused with fruit or classic flavor notes. Try the oaky Valpolicella or the flavor-bursting Famos Amos’ Sangiovese. As if you needed another reason to visit the famed Grand Strand, La Belle Amie makes the perfect escape from the bustling tourist-filled area. Home of the Twisted Sisters wines, the vineyard plays host to festivals throughout the year. Take a taste on site before you take a bottle (or two) home with you. The name is a nod to Lowcountry heritage, but the owners refer to it as a chance to do something great in life’s short span. Not only can visitors sample several varieties of muscadine wines, they can also meander the many onsite trails, visit with the animals, stroll through the garden or around the pond, and pick up some goodies in the gift shop. Pack a picnic—you’ll be glad you did. 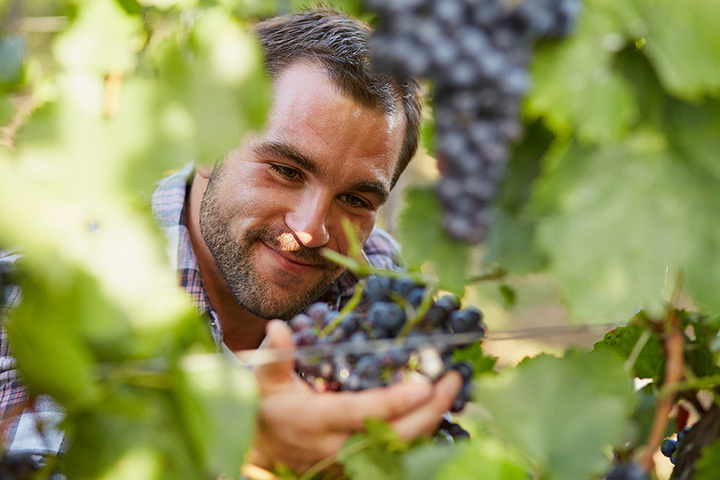 Grapes aren’t the only fruit that make for good wines. Carolina Vineyards proves that, making flavored wines using state-grown fruits. For just $3 you get a seven-sample variety of some of the best flavors of the south. Every bottle doubles as a souvenir, as each label aligns with a Myrtle Beach theme, so take a few to the folks back home. What’s better than an old-fashioned European style winery? How about one that you can visit stateside and also grab some lunch? One step inside the French-style chateau and you’ll feel like you’re not in Kansas anymore, Toto. Fill up on a fresh salad or sandwich, or head straight to the tasting room. And for the true wine aficionados, sign up for the Wine Club for a quarterly shipment of fine wines straight to your doorstep. Greenville isn’t all about city life. A mere 30-minute drive from downtown awaits the quiet landscapes of City Scape Winery. Owners Josh and Deb are the youngest vineyard owners in the southeast, and their passion for the grape reflects in every bottle they produce. Join in on a wine-making class, stock up on wine-making supplies, create your own custom labels for special people or events, or make an entire evening of it during special tastings and events. Can’t find time to squeeze in a visit? Order a bottle online. Not all the great wineries need an onsite vineyard. At least, this one doesn’t. They source their wines from some of the finest vineyards in South Carolina and around the world. And while you’re there, find out all about their special Sherry Pepper Sauce (yes, that’s a real thing). Delivering a classic winery and vineyard experience, Enoree River Winery features a wine list full of must taste varieties. You can visit the winery year round, but for an amazing experience drop in on their Annual Harvest Festival. Finally, a winery that also doubles as a beer brewer’s paradise. Grapes and Grains offers the best for craft beer enthusiasts and wine lovers alike. Shop for beer and wine making supplies, consult with a professional beer or winemaker, or schedule a class to learn everything you need to know about making your favorite drink at home. View more South Carolina Wineries & Vineyards.